Here, then, are this week's feature law blog posts. I have taken the liberty of being a complete library geek and cataloguing the posts according to the Library of Congress schedule for K - Law (or an approximation thereof). I note that in Canada, many law libraries employ a modified version of this scheme, known affectionately as KF Modified. At Balkinization, Sandy Levinson offers More on Presidential dictatorship in a thoughtful, in-depth post. J. Louis May discusses his method of preparing for exams in his post How I "Do" Law School Exams: at The Legal Scoop. Preparation and organization are key! Al Nye tells us about The Power of Nice at Al Nye The Lawyer Guy. The title says it all! Scott Greenfield presents It's Tough To Be The Big Guy posted at Simple Justice, a commentary on the blog post Not Really Legal MalPractice But… by Andrew Lavoott Bluestone over at the New York Attorney Malpractice Blog. The post is about a no-confidence vote in making Manhattan attorney Raoul Lionel Felder chair of the New York State Commission on Judicial Conduct because of a book he wrote with comedian Jackie Mason, entitled Schmucks! I love seeing people honour their colleagues! Stephanie West Allen does just that in The motley band of lawyers: Let's honor the diverse symphony of the profession posted at idealawg. She discusses the myriad reasons lawyers went to law school, and quotes a number of comments from individuals. I found this an up-lifting read, confirming that so many people want to work towards making a positive impact on society. Patrick J. Lamb at the blawg In Search of Perfect Client Service takes A Sobering Look Into the Future. With the exponentially accelerating flattening of the world, the standard law firm structure must be reexamined. It appears to the author that big firms, like many big businesses, will be particularly challenged to thrive in an environment where both China and India are each producing more honors students annually than the total number of students in the United States. Businesses will be confronting problems with technology that has yet to be developed. The author simply raises the question of whether a seismic change in the law profession is on the horizon. Good news for blogging law firms! In Chubb Insurance law firm blog update: Big to do about nothing Kevin O'Keefe reports at Real Lawyers Have Blogs that the recent kerfuffle caused by Chubb's recent denial of coverage for a law firm which has a blog has been much ado about nothing, as Chubb has essentially backtracked from their earlier position. “…the insurer now says law firms publishing blogs will be covered by their malpractice policy so long as lawyers are not answering specific questions in a way that could be construed to be legal advice.” There is additional follow-up in O’Keefe’s post Malpractice coverage and blogs: More lawyers respond to Chubb Insurance. The argument that time recording enables managing partners to assess the level of work being carried out by their fee earners also no longer holds true, because the technology in place enables tasks such as standard letters and documentation to be processed in a fraction of the time which would be recorded as single unit for time recording purposes. Those firms that survive will be those who embrace such technology, together with the desires of the client for greater transparency, and provide clients with a fixed fee quotation for the work to be undertaken. Timothy Bishop describes A Good Example of "Unprofessional Irresponsibility" posted at The Legal Scoop. In Enough Health 2.0: What about Law 2.0? Avvo posted at Health Care Law Blog, Bob Coffield gives us advance notice of Avvo, a “Law 2.0” service just setting up shop in Seattle. Hanna Hasl-Kelchner pulls together a number of news making events in Two Universities and a Shock Jock posted at LegalLiteracy.com. She discusses lessons the Virginia Tech, Duke lacrosse, and Imus firing can teach business about building a culture of compliance. Amidst discussion of increased and decreased gun control in the wake of the Virginia Tech murders, at Is That Legal? Eric Muller wonders how a Kent State situation happening again on a well-armed campus would turn out. See his post Gun Control, Campus Shootings, The Wild West, and Kent State. Eugene Volokh at The Volokh Conspiracy takes the discussion a step further in So What Are We Going To Do About It?, discussing how rare but horrific events like the murders can skew public consideration of related issues. At The Technology Liberation Front Adam Thierer argues the FCC should not take the Don Imus situation as an opportunity to regulate hate speech on-air in post Don Imus and the FCC: Should Hate Speech be Regulated? Over at Overlawyered, Ted Frank presents Underlawyered: Iran comparing the U.S. litigation and tort system with Iran’s. Mark Herrman and Jim Beck present Why Does Preemption Matter? at the Drug and Device Law blog. This post explains why, in pharmaceutical product liability cases, the defense of preemption is important to drug companies. The post was prompted by media inquiries arising out of Merck's preemption victory in the Vioxx statewide coordinated proceeding in Texas. Nicole Black presents Rebel With a Cause, or Without a Clue? posted at Sui Generis--a New York law blog. “On March 19, the U.S. Supreme Court heard oral arguments in this case, during which our finest judicial minds used their collective brainpower to decipher the underlying meaning and free speech implications of a nonsensical phrase first seen by Frederick on a snowboard. “Bong Hits 4 Jesus” — a seemingly meaningless slogan made suddenly meaningful by virtue of the possibility that it could change First Amendment jurisprudence for generations of teenage pranksters to come. By either design or mere happenstance, Frederick hit the judicial jackpot.” Black takes law blog posting to a new level by including a related video in her post. An emu dead under suspicious circumstances gives Norm Pattis pause for reflection and self-accusation and a new understanding of guilty conscience confessions by innocent suspects in J’accuse at Crime & Federalism. Scott Greenfield is on a roll this week at Simple Justice! In My Brain Made Me Do It! he discusses the difficult question as to how those suffering from some mental illnesses are treated in the courts, that there is either “not guilty by reason of mental disease or defect” or guilty (i.e. evil) with no middle ground. Even the subject headings in the cataloguing system don't seem to handle this subject very well. Scott Greenfield presents It's the Defense Lawyers, Stupid posted at Simple Justice in response to Randy E. Barnett, in an April 17th Wall Street Journal editorial, Three Cheers for the Lawyers. Conservative MP Joy Smith yesterday introduced the Clean Internet Act (Bill C-427). The private member's bill would establish an Internet service provider licensing system to be administered by the CRTC [Canadian Radio-television and Telecommunications Commission] along with "know your subscriber" requirements and content blocking powers. Just about everything associated with this bill is (to be charitable) rather odd. How best to provide reference services in libraries has always been of debate by law librarians. The centralized reference desk in some types of libraries has gone in and out of style over the years. Now with new technologies, methods of service delivery have becoming increasingly diverse. Over at Out of the Jungle, Marie S. Newman opens up the subject for conversation in The Future of the Reference Desk. At WisBlawg celebrity law librarian blogger Bonnie Shucha shared with us the "Read" posters put together by the University of Wisconsin Law Library in celebration of the U.S. National Library Week. This year's posters feature UW Law School faculty members Ken Davis, Allison Christians, and Jim Jones. What a great idea! Scott Vine, a.k.a. Information Overlord out of the U.K. tackles the new assertion that supporters of the concept of net neutrality also support piracy in Net Neutrality supporters = Piracy Supporters. Worth noting: he also does a nice little round-up of new technology ideas in a snappy regular feature called Odds & Sods. Michael Stokes Paulsen is guest blogging over at Balkinization. The Pernicious Doctrine of Stare Decisis is a thought-provoking post arguing against the principle of stare decisis: "Stare decisis is a charade. The doctrine, taken seriously, suggests that judges should deliberately decide cases in ways they otherwise are fully persuaded are wrong, on what they otherwise would regard as the proper interpretive criteria -- sometimes . . . Taken seriously, the doctrine is unconstitutional: it suggests that a court should prefer the (by hypothesis) faithless earlier departure from the Constitution to the correct understanding of the Constitution, in situations where they conflict." If this topic hits home with you, be sure to read through the thorough discussion in the comments as well. Jim Calloway's Law Practice Tips Blog covers the session Gadgets, Gadgets Gadgets presented at Computers in Libraries this past week in Librarians Show Off Cool Gadgets. Calloway says: “Like many others, I love a program about tech-related gadgets. Too bad none of us can afford all of the gadgets we want. Barbara Fullerton, Manager, Librarian Relations, 10-K Wizard, Sabrina Pacifici, Editor & Publisher, LLRX.com and beSpacific.com and Aaron Schmidt, Director, North Plains Public Library, gave their annual presentation on gadgets at the Computers in Libraries meeting. They have posted a PDF of their PowerPoint on LLRX.com for all to enjoy. This is one of the best gadget round-ups you will find. They even include gadgets not yet available.” I was at the session and have to say my favourite gadget was the low-tech reusable collapsible chopsticks. Madinkbeard agrees. If you like to keep up with the latest in tech tools (we're talking on the web, not gadgets this time), you should have a look at lo-fi librarian's weekly This Week's Useful Tools. Lots to keep you busy for a full week until the next list! Leon Gettler presents Judges' low opinion of auditors posted at SOX First. Gettler provides a warning for auditors: researchers have found that judges now have a low opinion of them and they will no longer take the excuse that a bad set of accounts is management’s responsibility. That means more auditors could be taken to court and put out of business. At The Volokh Conspiracy, Orin Kerr has a lively discussion about cyber-bullying, a subject close to my heart, taking place. In Legal Responses to “Cyber-Bullying”, he suggests that provider immunity for online defamation and "cyber-bullying" could be conditioned on simple measures to prevent search robots from indexing offending "free-for-all" sites. But who would really want to trade indexing on Google for allowing anonymous comments on a blog? Not me. Timothy Bishop talks about the FCC’s attempt to curb the “payola” practice in the U.S. radio industry in Payola Settlement between Gov't & 4 Broadcast Companies posted at The Legal Scoop. And over at Concurring Opinions, Frank Pasquale describes how the pending XM-Sirius merger may be a "standard-setting" merger which promotes innovation and saves an industry -- satellite radio -- and why that position might have changed since the FCC's original licensing of the former competitors in the post The XM-Sirius Merger. Those of us in the blogosphere should take note of Walter Olson’s update on accounts from authors of medical blogs who are being pulled into malpractice suits at Doctors' first-person accounts of litigation posted at Overlawyered. Ron Coleman presents That’s a wrap posted at LIKELIHOOD OF CONFUSION. In it, Coleman follows up on an earlier story about New York Metropolitan Transportation Authority’s IP enforcement program focused on the train symbols of the NYC subway system, how those symbols are pretty much being used by other agencies including the NYC Department of Health and Mental Hygiene to promote condoms. Bonus points for the double-entendre post title! Billy Goat Tavern, 430 N. Michigan, Monday Night, April 30, 7:30 to 9:30. Convenient to all buses going to bigger better financed INTA parties. Ron Coleman of Likelihood of Confusion, John Welch of TTAB Blog and a domestic shorthair from IPKat will be signing copies of their blogs. My colleagues from Moses and Singer will buy you a drink. Special prize to the best avatar. Episode 011 of Rules For The Revolution: The Podcast by Colette Vogele is entitled Fair Use!. This episode brings back Tony Falzone, Executive Director for the Fair Use Project at Stanford's Center for Internet and Society. Tony describes what Fair Use is under the Copyright Act, and how the law is developing in this important field that helps to balance copyright and free speech under the First Amendment. It's sometimes too easy to mock Anthony Kennedy, and people sure have done a lot of it over the years. He can seem infuriatingly unmoored. He agonizes over his decisions. He's been known to change his mind in a case or two. And his writing style is about as grand as his ornately decorated chambers in the Court. But in yesterday's landmark abortion case, Kennedy was the Associate Justice he believes himself to be. In Another Reason Not to Elect Judges Norm Pattis discusses the catch-22 situation wherein elected judges are expected by voters to comment on issues of interest, yet are prohibited in doing so by ethics rules over at Crime & Federalism. In"Eenie Meenie" redux posted at Overlawyered, David Nieporent talks about a summary judgment in favour of an airline in a customer service complaint from a 1996 flight. Scott Felsenthal tells us about a Cruel Craigslist Hoax over at The Legal Scoop. Be careful what you read on the Internet, people! In NJ comp fraud case: lawyers settle out, workers nailed posted at Overlawyered, Walter Olson tells us about 84 workers who are personally on the hook for at least $2.26 million after filing en masse for workers compensation following the closing of a bathroom-components factory in New Jersey. Scott Henson discusses how data gathered by Texas police indicates there are racial disparities in searches associated with traffic stops, and how wide disparities also exist in the rates of searches for all races from department to department. He indicates: “changes in the law would allow law enforcement to drill down into these data deeper to determine whether departments that search more often gain any law enforcement benefit from the practice.” See Traffic stop info shines light on police searches; date needs tweaking for maximum benefit at Grits for Breakfast. The Austin DWI Lawyer Jamie Spencer writes about flaws in three new proposed pieces of DWI legislation in Texas. He comments on each in individual posts all available from 3 DWI Bills covered by the Austin American Statesman. Dan Harris presents Danone v. Wahaha - Which Of Us Is The Most China Rookie? posted at China Law Blog, discussing an IP dispute between Danone and Wahaha in China, and then broadens the lesson to give some precautions about joint ventures in China. The University at Buffalo Law School is taking an interesting approach to covering research and ideas by faculty and other prominent scholars by podcasting what it calls "Faculty Conversations." Instigated by Jim Milles, the conversations take a more accessible approach to the formal papers regularly presented by faculty. The latest of these is Faculty Conversation: David M. Engel on Legal Pluralism and Injury in Contemporary Thailand. Linkworthy - wrapping things up! You want to succeed in your blogging initiatives. Others want to do the same. If everyone thinks that ONLY they want to succeed, it will be hard work for everyone. Please spread the word about other blogs. You don't have to promote other blogs blatantly. A little bit of "link love" will go a long way. Don't worry. People will reciprocate if you write "linkworthy" content. Brett Trout, who will be hosting Blawg Review #106 on April 30th, has compiled the Top 10 Ways to Commit Malpractice with Your Blog including references to Kevin O’Keefe’s post mentioned above. Now, that's linkworthy. Disclaimer: I am not a cataloguer. The classifications applied to blog posts above are for entertainment purposes only and may be inaccurate. These should not be used for cataloguing purposes. 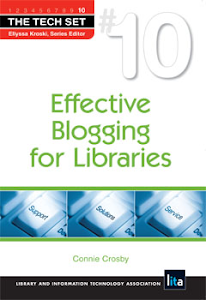 Please consult a cataloguer for questions about categorization and classification of your blog or blog posts. I assume no responsibility for any party who applies these classifications to blogs or blogs posts and is thereby unable to locate respective information in searches. Wow! You didn't do that Blawg review in 15 minutes Connie. That's a heck of a summary. By the way, heard from LexisNexis that they have a couple blogs - will update my blog. Blawg Review #105 Coming Soon!! The Library of the Future - Darien Library! Third Winner Found in Blog Anniversary Draw! Have You Found Your Second Life Yet?